This large two bedroom with a loft and 3 baths can handle up to 10 people. 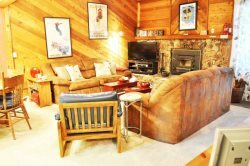 It Is located a stones throw from Canyon Lodge and the lifts, with dining nearby. With shuttle access just out your front door the entire town of Mammoth is easily accessed . The unit boasts a large dinning room that will fit the entire family for dinner and two large den seating areas that allow one group to be watching T.V while the other group relaxes by the fireplace. The two bedrooms downstairs come complete with Queen beds and private baths.